Christopher Columbus Smith was just 13 when he built his first duck boat in the backwoods of Michigan in 1874. More than 140 years later, Chris-Craft -- the company Smith eventually founded and his heirs would oversee until 1960 -- still makes boats and most of the components that go into them in Sarasota, Florida, where 200 skilled boat-builders work to restore an iconic American company. Smith's heirs ran the business for nearly a century, building boats favored by U.S. presidents and Hollywood royalty. They even were used to storm the beaches of Normandy 70 years ago this June. But in 1960, the Smith family sold Chris-Craft to a conglomerate, NAFI Corp., which soon renamed itself Chris-Craft Industries, just as the boat industry was shifting from wood to fiberglass. NAFI, which stood for National Automotive Fibers Inc., had initially produced upholstery and other components for the auto industry but eventually began investing in the energy sector and buying up television and radio stations. 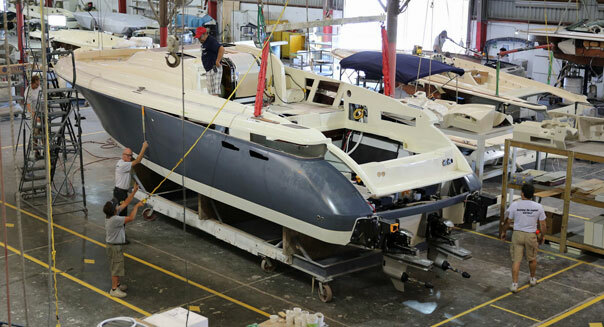 As the years progressed, Chris-Craft struggled inside the bigger company and was sold in 1981 and again eight years later, losing the rights to its own name in the process. In 2000, the owners filed for bankruptcy. That's when two classmates from Harvard Business School took over. Steve Heese and Stephen Julius had not only gone to school together, they had rebuilt other legendary companies, including American-made Indian Motorcycles. The struggling Chris-Craft was just their sort of project. "The company lost its way and lost what made it great," says Heese, who serves as president and CEO, while Julius is the chairman of board. "The brand is a promise, and that promise got broken after the family sold the company. We remade that promise." They steered the company through the worst of the Great Recession by designing boats that reclaimed and refined Christopher Columbus Smith's original vision. Today, the two men are focused on making boats in America that the 19th century boatmaker would be proud of -- even though going overseas may make them cheaper. But not better, Heese believes. "I just look at what we go through to get the level of quality that we want -- that we demand -- and I don't think we could get it outside of the U.S. "
Keeping that promise, however, takes a lot of hard work. For Chris Collier, Chris-Craft's vice president of engineering, living up to Smith's original vision comes naturally. Boat building is in his blood. Around the time Smith was designing his first boat, Collier's great, great grandfather William Thomas Collier was building schooners to deliver cargo along the Gulf Coast from his base on Marco Island in Southwest Florida. His descendants continued this legacy for the better part of 150 years, and Collier learned the craft from the ground up, working in his father's boat shop during high school. After college, he came back to the boating industry and never left. Given his history, Collier has some insight into how Chris-Craft veered off course -- and how Heese and Julius have inspired a renaissance. He says after the Smith family sold the company, the new owners saw it as just another boatmaker. "They went way off track. Started to go down the mainstream," Collier says. "They built these me-too boats -- every boat that goes along everybody else's lines. And it really lost its look, lost its identity. " The new team has worked hard to restore what made Chris-Craft distinctive. Pointing to a 1939 vintage boat on display in the factory lobby, Collier says, "The boat you see behind you, with the tumblehome" -- the narrowing of the hull above where the boat would sit on the waterline -- " on the sides? We still have that today. That same look. We've captured it. It's not an easy process to maintain." Collier's passion is translating designs from outside architects the company hires into finished boats by fusing traditional hands-on boat-making techniques with the latest technology. "From start to stop, right from the first one on the drawing to the boat in the water, we touch every piece of it," he says. The first step is to model the boat's hull and decks in three dimensions, using computer-aided design software. From that original design, the plans are sent to the onsite mill where any necessary molds and plastic and wood components are cut. But technology hasn't eclipsed Chris-Craft's heritage of a builder using his hands to craft a boat. "We still do a lot of hands-on stuff. Some things need to be developed and felt to actually evaluate some of the lines in person," Collier says. "It's one thing in the computer seeing it and full-size is another thing. Some of the important parts or the delicate parts we go ahead and build by hand so we can evaluate them on the floor." Andre Woodie's hands touch many of those parts and he has left his fingerprints on Chris-Craft boats for 23 years. Woodie didn't expect to become a master boat builder. He just needed a job after high school because he was about to become a father. "My dad was doing this type of work," Woodie said. "He gave me the application and said, 'Here you go.'" Woodie joined the lamination department, but two decades later oversees the team that constructs the basic elements of Chris-Craft boats. %VIRTUAL-pullquote-We're making something very special. Very special.%"We're making something very special," he said. "Very special." Chris-Craft boats are made to order. So the first stage in production is a multi-step lamination process where Woodie and his team create a watertight hull and deck superstructure from Chris-Craft's signature molds, some of which are based on decades-old designs. The lamination process includes applying a gel coat, or resin, and layers of cotton candy-like fiberglass. Despite being a team leader now, Woodie still works on the production floor, skillfully smoothing out each boat's surfaces after the initial fiberglassing, grinding down the rough coating before applying a final layer of gel coat. From there, the hull and deck components are pulled from their molds and taken to cutters who use jigsaws and diamond-studded grinders to cut and shape the hulls and preliminary decks to accommodate engines and other components. All told, it's a complicated process that takes about five to seven people working days per boat. But Woodie's team has a wealth of experience and is mindful of the institutional memory and the human capital that has sustained Chris-Craft since Smith built his first boat. During his 23 years, Woodie has experienced his share of cyclical peaks and troughs that are a fact of life in the luxury boating industry. In good times, there are plenty of boats to make and a large team to build them. In bad times, when people stop spending money on luxury goods, it's a struggle just to stay afloat. Woodie lived through the dark days of the 2000 bankruptcy, before Heese and Julius stepped in, and he weathered the Great Recession when many competing companies went under and Chris-Craft's survival was hardly certain. But despite the ups and down, it's a profession that helped him grow from a teenager expecting his first child to a father who, because of a good job, has put four children through college and is ready to see his fifth child go to college as well. "So it's been good for me. It's been a blessing for me," he says of Chris-Craft. For decades, Chris-Craft boats were known for their distinctive mahogany hulls and teak decking. The introduction of fiberglass made wooden hulls obsolete, and Chris-Craft's last mahogany boat rolled off the line more than 40 years ago. But the handcrafted teak decks have survived and remain among Chris-Craft's most defining features, providing a vital link to the company's history. %VIRTUAL-article-sponsoredlinks%For John Caserta, learning that link and how to work with the wood began 12 years ago when he joined the teak shop. He didn't know a thing about boats, but it only took a few shifts for Caserta to realize that this was more than a job. It was a defining passion. His bosses recognized his ability to prepare and fit the wood, sending him to spend a month with the nearby wood supply company that imports Chris-Craft's teak from overseas so he could truly master a job that takes precision and artistry. Caserta finds the most pleasure in seeing his contributions as part of a larger whole, knowing he's part of reviving a legacy of American craftsmanship that goes back more than a century. Each portion of the teak decking he shapes and installs is an important part, but constitutes only a small piece of a greater mosaic. The completed boats -- not just the completed decks -- are what give him real satisfaction. "When you're just working around back there," he said, gesturing to the teak crew's garage-like outbuilding, "it's just a deck with some wood. When you see the finished product, it's awesome."